I had the privilege to meet Ferree Hardy last year who authored, “Postcards from the Widow’s Path.” We first met through our blogs and then had the opportunity to have lunch one day when she was in Atlanta. It was wonderful to meet another remarried widow that had authored a widow’s book to show the glory she gives to God and how she walked by faith to a renewed life. It’s nice to know that there are many resources of hope for widows. We widows have to stick together and show, that if we pursue God’s help and provision in our lives, we can have a renewed life with joy, peace and purpose! 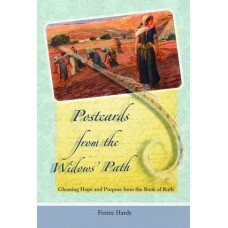 I love Ferree’s book, Postcards from the Widow’s Path. She is an excellent writer. I only know Ferree through her blog, but I would love to meet her someday. I can tell she had a heart of love for others and spends much time reaching out them. I now am anxious to order A Widow’s Pursuit. Thank you ladies for putting yourselves “out there” for the rest of us widows. Thank you, Sorrowtovictory, in sharing your kind and encouraging words. We all pay it forward as it gives purpose to our loss to help others. Widowhood is not fun! But it helps to know we are not alone and others feel the same way. And it’s also nice to know that one day, with God’s help, there can still be joy and happiness after our loss.